Both the current and the previous US administration swear by sovereignty and the right of nations to choose their own way. In practice, however, only one choice is acceptable to Washington ‒ as Serbia discovered back in 1999, and was just reminded of. On Monday, US Deputy Assistant Secretary for European and Eurasian Affairs Hoyt Brian Yee told the government in Belgrade that Serbia “cannot sit on two chairs at the same time,” and “must very clearly demonstrate” the declared desire to join the European Union. “Countries must choose which path to follow; regardless of how difficult it would be, the country has to make its strategic choices which must be part of official policy,” Hoyt said, according to AP. “This is not a statement made by a friend or a person respecting Serbia, respecting our right to decide independently,” he said on Tuesday. In this bit of editorial guidance, one of the world’s biggest news agencies basically suggests that seeking membership in the EU, NATO and “other Western bodies” is normal and desirable, while any reluctance to do so must be down to Russian pressure. Anyone even remotely familiar with recent history, though, will recall why most Serbians might be opposed to that choice. The Deputy Assistant ought to remember as well: according to his official State Department biography, in 1999 he was Deputy Director of the Private Office of NATO Secretary-General Javier Solana. The war violated NATO’s own charter as well as that of the UN. 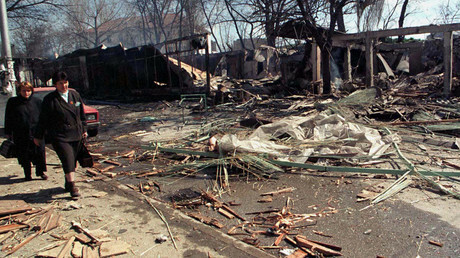 For 78 days, NATO targeted civilian infrastructure, including the Serbian state TV station, in an attempt to force Belgrade to surrender its province of Kosovo. Yet the world’s most powerful military alliance, as NATO fancies itself, failed to achieve its objectives by force. It was political subterfuge that let alliance occupation troops into Kosovo, under the fig leaf of a UN peacekeeping mission (UNSC 1244). The ethnic Albanian rebels declared independence in 2008, and the government in Serbia has been under pressure to recognize the separation ever since. "It was Yugoslavia's resistance to the broader trends of political and economic reform ‒ not the plight of the Kosovar Albanians ‒ that best explains NATO's war,” wrote John Norris (‘Collision Course,’ 2005), with the endorsement of the State Department’s foremost Russia expert, Strobe Talbott. Yet it was NATO’s attempt to crush Yugoslavia’s stubborn resistance to its post-Cold War dominance that “lost Russia,” dispelling illusions about Western-style liberal democracy that had taken root in the Yeltsin era. “It is fair to say that all layers of Russian society were deeply and indelibly shocked” by NATO’s bombing, the legendary Soviet dissident, Aleksandr Solzhenitsyn told Der Spiegel in 2007. 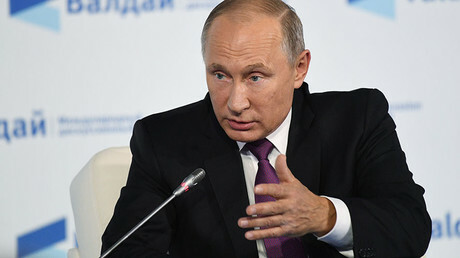 “What we got in return is well-known – a complete disregard for our national interests, support for separatism in the Caucasus, a circumvention of the UN Security Council, the bombing of Yugoslavia, the invasion of Iraq, and so on,” Putin said at the Valdai discussion club in Sochi. Now, both the current and the previous US administration often speak of the “world order” the US has built and act as guardians of, in which countries are free to make their own decisions and choices as to who they associate with. “Like all independent nations, Ukraine must be free to decide its own destiny,” Barack Obama said in September 2014, addressing the people of Estonia. Three years later, his successor Donald Trump would tell the UN General Assembly that Americans “do not seek to impose our way of life on anyone, but rather, to let it shine as an example for everyone to watch,” and that he was “renewing this founding principle of sovereignty” in Washington’s conduct of foreign affairs. Nor has Serbia been allowed to make its own choices since its own “regime change” in 2000, with every government in Belgrade being “midwifed” and managed by the US ambassador or some Deputy Assistant or another. For all of Trump’s promises to “drain the swamp” and complaints he’s purging the State Department, this US policy has yet to change. The current government of President Aleksandar Vucic was allowed to come to power only after bending the knee and letting Western consultants rebrand them as “progressives.” Since then, Vucic has implemented every US, EU and NATO demand, including the de-facto recognition of “Kosovian” independence in the form of borders, courts, government, documents, and international memberships. That’s not good enough, of course: the EU is demanding official recognition before talks on Serbia joining the mega-state can even start. According to the Deputy Assistant and mainstream media, such behavior amounts to choice and democracy, while any actual independent thought is “pro-Russian” and “sliding toward the Kremlin.” Good to know.